It’s been said that all trends are cyclical, and that everything tends to go in a 30-year cycle. Over the years, we have seen this process happen with skateboards as much as anything else. Currently, there are more and more skateboards that take their inspiration from the early days of skateboarding, when the closest thing to a skate park that existed was a drained in-ground pool left unattended in the backyard of an unsuspecting neighbor. The legendary Santa Cruz Skateboards brand is proving that everything old is new again with their Santa Cruz Land Shark Rasta skateboard. Right off the bat the first and a very huge positive about Santa Cruz Skateboards Santa Cruz Land Shark Rasta is the bottle opener built into the deck. This is a very simple but incredibly cool and appealing feature of the Santa Cruz Land Shark Rasta. Little touches like this show that Santa Cruz Skateboards are still leading the industry in innovation and creative skateboard design. Speaking of design, the Santa Cruz Land Shark Rasta, while a cruiser skateboard, still has a very similar form factor to its contemporary counterparts as far as width goes and pays homage to early skateboard designs with a very surfboard style cut to it. Looking at it from above, you expect the nose to be completely flat, but it does in fact have a very nice curve to it that will give you more control and flexibility. As long as you aren’t planning on doing many tricks with it, the Santa Cruz Land Shark Rasta will give you a very smooth ride, especially with its thick 65mm wheels, which will allow you to easily roll over any rocks or twigs that get in your path. As comfortable a ride as the 65mm wheels will give you, they are also probably the biggest fault with the Santa Cruz Land Shark Rasta, simply because they feel very soft so you may need to replace them sooner than later due to wear. Another drawback for some is simply the fact that this is a cruiser skateboard, so be sure to take your individual style and use into consideration. If you are looking to spend your days gleaming the cube, you will be better served by looking at a more contemporary deck, of which Santa Cruz Skateboards has many. If you are simply looking to glide down the sidewalk on a sea of cement, then this is a brilliant cruiser skateboard. 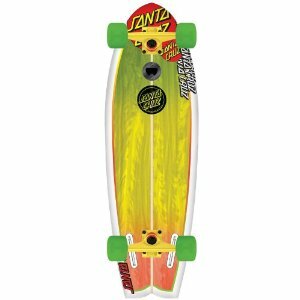 The Santa Cruz Land Shark Rasta skateboard is a great cruiser deck, and the built in bottle opener is one of the most clever additions to be seen on a skateboard. At just over $100 it’s not the cheapest skateboard out there but we think it is well worth the price. This entry was posted in Reviews, Santa Cruz, Skateboarding, Skateboards and tagged Land Shark, Rasta, Santa Cruz, Skateboard, Skateboard Review. Bookmark the permalink.